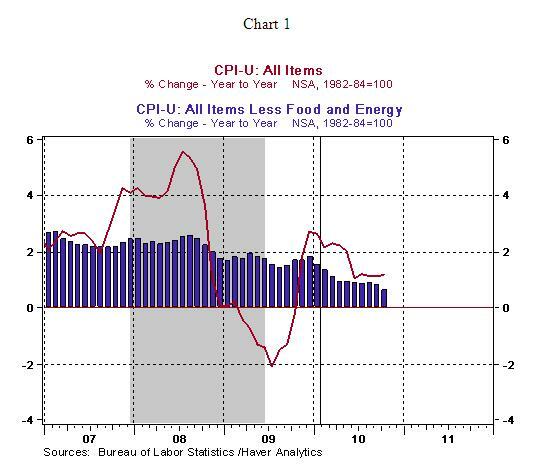 Is Inflation Lurking Around the Corner? The potential inflationary impact of the second round of quantitative easing, QE2, is at the top of the list of charges critics have complied against the Fed. 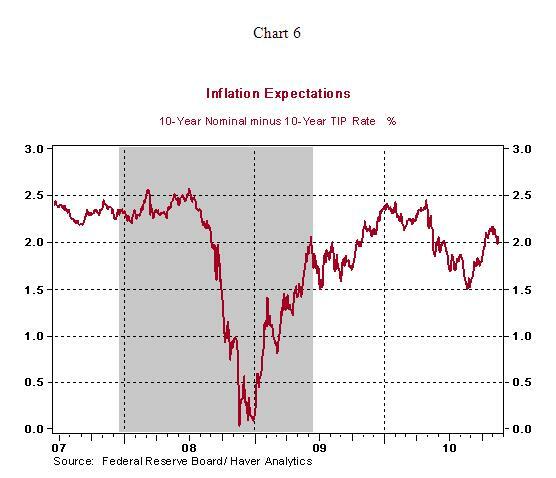 Let us look at the current evidence on inflation, inflation expectations, and the Fed's tool kit to fight inflation to conclude if the fear of inflation is credible. Starting with the Consumer Price Index (CPI), the October CPI rose 0.2% and the core CPI, which excludes food and energy, held steady. The year-to-year change of both price measures shows a decelerating trend since the early part of the year (see chart 2). 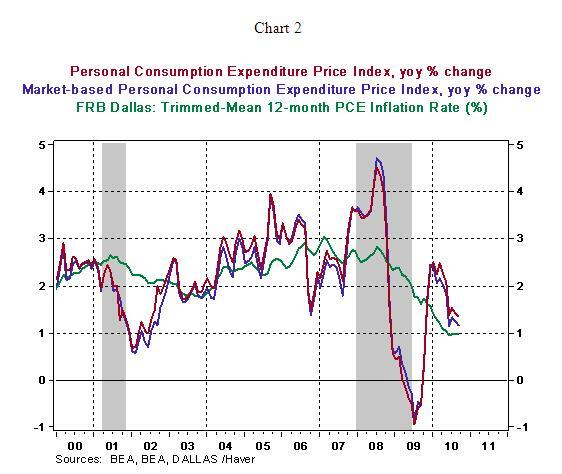 The Fed's preferred price measures of personal consumption expenditure index and the corresponding trimmed mean index from the Dallas Fed also indicate a low inflationary environment (see chart 2). Therefore, there is no evidence of a sharp increase in prices, currently. Moreover, there are ample unused resources in the economy. 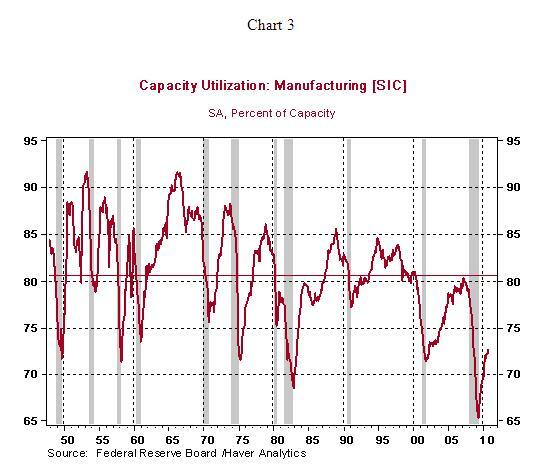 The operating rate of the nation's factories is roughly 8 percentage points below the historical average (see chart 3). The unemployment rate continues to hover around an elevated level of 9.6%, with projections of higher jobless rate in the months ahead before it reverses course. Essentially, supply-demand situation in the labor market is unlikely to undergone a rapid transformation in the months ahead and translate into rising labor costs. 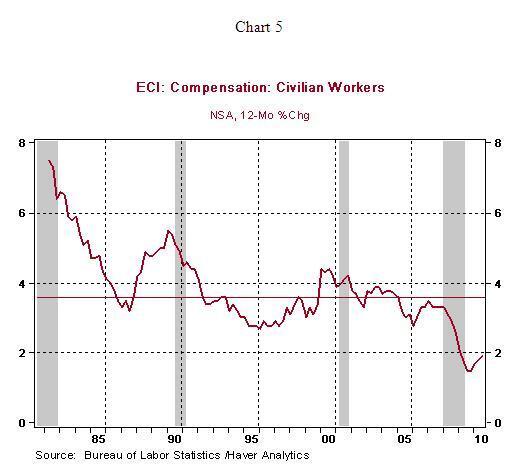 Speaking about labor costs, they are also trending down and do not present an inflationary threat. The Employment Cost Index moved up 1.9% from a year ago in the third quarter. This is marginally higher than the historical low reading of a 1.5% increase in the second half of 2009. The median year-to-year gain of the Employment Cost Index is 3.6%, which is 170 bps higher than the third quarter increase of 1.9%. The main conclusion from chart 5 is that employment costs are more than contained. How about expectations of inflation? Inflation expectations as measured by the difference between the 10-year Treasury note yield and 10-year inflation protected securities has moved up, roughly 45bps, since Chairman Bernanke delivered the Jackson Hole speech on August 27. The increase is noteworthy but not large enough to solicit appropriate action immediately (see chart 6) and it is still below levels seen prior to the onset of the financial crisis. Summing up, an inflationary threat is not lurking in the corner and nor are the current readings of inflation measures at levels the Fed needs to fret about in the near term. Let us entertain the possibility of severe inflation as a result of QE2. In this scenario, does the Fed have tools at its disposal to step in and prevent an inflationary environment from becoming entrenched in the economy? The Fed has traditional tools of monetary --increase raise reserve requirements, raise the federal funds rate or undertake open market sales of securities -- and also a new instrument, raising the interest rate paid on excess reserves. Is the Fed incapable of taking pre-emptive action? 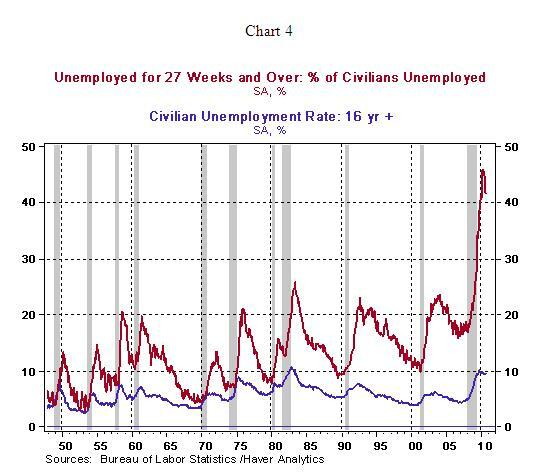 The probability of delayed action to address the prospect of rising prices is small and will occur only if the unemployment rate continues to hover around an unacceptably high level. After covering all bases, it appears that inflation hawks do not have an airtight case to support their contention that QE2 is tinder for future inflation.